Just because a man cheats on his wife and makes Danny DeVito look tall, dark and handsome, is that any reason to kill him? The reluctant and quirky PI, Lee Alvarez, doesn't think so. The 34-year old, half Latina, half WASP and one-hundred percent detective has her work cut out for her when the man is murdered on her watch. Of all the nerve. 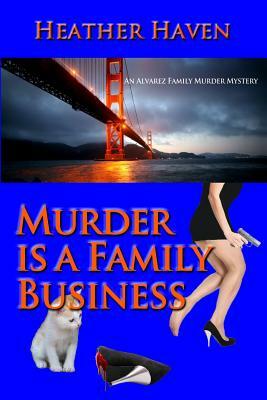 Murder is a Family Business is the first in a series of humorous mysteries revolving around Lee Alvarez, a combination of Sue Grafton's Kinsey Millhone and Janet Evanovitch' Stephanie Plum, and the rest of Alvarez Family. Completing the family is Lee's "Never-Had-A-Bad-Hair-Day" aristocratic mother, Lila; computer genius brother, Richard; beloved uncle "Tio;" and her energetic orange and white kitten, Tugger. When this group is not solving murders, they run Discretionary Inquiries, a successful Silicon Valley agency that normally deals with the theft of computer software. Seemingly light and frothy on the surface, the novel explores familial love: the good, the bad and the annoying. "Heather Haven makes a stellar debut in Murder is a Family Business. Liana (Lee)Alvarez is a tough, yet sensitive PI who works for her family's business-a high tech PI firm in the heart of Silicon Valley. When Lee stumbles onto a murder in a warehouse at San Francisco's Fisherman's Wharf, she calls upon her family--a blue blood mother, a computer-genius brother, and a good-hearted uncle--to solve the case. With an engaging protagonist and a colorful cast, Haven provides a fresh voice in a crowded genre.We will be hearing more from this talented newcomer. Highly recommended." ---Sheldon Siegel. New York Times Best Selling Author of Perfect Alibi.